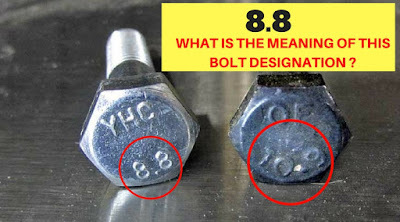 Mechanical Minds: MEANING OF GRADE WRITTEN ON BOLT HEAD EXPLAINED !! A fastener is a device that mechanically joint two or more objects together. In general, fasteners are used to create non-permanent joints. That is, joints that can be removed or dismantled without damaging the joining components. Before starting we need to clear some basic mechanical engineering concept. Proof Load: It is defined as the maximum tensile force that can be applied to a bolt that will not result in plastic deformation. In other words, the material must remain in its elastic region when loaded up to its proof load. Yield Strength: Maximum load at which a material exhibits a specific permanent deformation or plastic deformation. Tensile Strength: Tensile strength is a measurement of the force required to pull something such as rope, wire, or a structural beam to the point where it breaks. The tensile strength of a material is the maximum amount of tensile stress that it can take before failure. Now let’s explore all thing in deeply. The grade of your industrial fasteners not only determines how much stress they are able to stand, but also why type of tool must be used to tighten them. For a grade 8.8, you must use the part turn method of tightening with a torque wrench; this is where the fold is fit snug tight with your fingers and then advanced up to three turns, depending on length and size. Indicating washers may also be used in the part turn method, and added security of the joint can be accomplished by using other fasteners and fixings, such as spring washers, wired heads, nuts, and split pins. What’s the difference between 10.9 and 8.8 bolts? The first digit relates to the ultimate strength of the material, while the second is the ratio of yield stress to ultimate strength. Thus grade 10.9 bolts have an ultimate material tensile strength of 1000N/mm2 and the yield (or proof) stress is 90% of the ultimate strength. Similarly grade 8.8 bolts have an ultimate strength of 800 N/mm2 and a ratio of yield/proof stress to ultimate strength of 80%. Superb, all engineering guys are used lot of mechanical items but they know what is the spec and where it is use. Thank you I really appreciate it. Keep it up. Can we tell the configuration with grade for metric bolt? Is that correct?